Are you looking to perfect your Lord of the Dance yoga pose (Natarajasana)? Follow this visual guide to make sure that you are doing this yoga pose just right. The perfecting your yoga poses article series was created in partnership with Arundhati Baitmangalkar from Aham yoga Redmond. Arundhati fondly known as "Aru" has been teaching for over 8 years now. She is an experienced yoga teacher as well as a Bollywood performer and instructor. 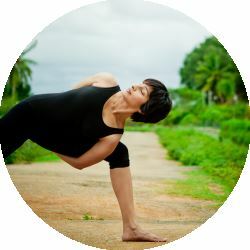 She has studied classical hatha, vinyasa Iyengar and power yoga in India and she strives to make her culture and tradition available to everyone. She runs her own yoga studio, Aham Yoga, in Redmond.